During the module “Explore Technology” at Hyper Island, we were asked to create a predetermined feeling using technology. This resulted in an exhibition, where the aim was to design a meaningful experience for the visitors. Initially our team felt like the underdogs, as we were the team selected with the least skill and comfort when experimenting hands on with technology. However, what we lacked in technological know-how we made up for through our shared interest in the approach we chose. Our approach was to try and apply technology to shine light on a societal problem. To do this, we picked a topic that we all felt strongly about - the stigma of menstruation and PMS. As this topic is something that affects everyone in some way, we chose to focus on creating an experience that would evoke the feeling of empathy. Due to the stigma, we realized that many aspects of the menstrual cycle and PMS were unknown to not only us, but arguably the majority of today’s society. Fortunately, in an interview with Swedish comedienne Karin Adelsköld, our team was reminded of the imposed normalcy aspect of menstruation. 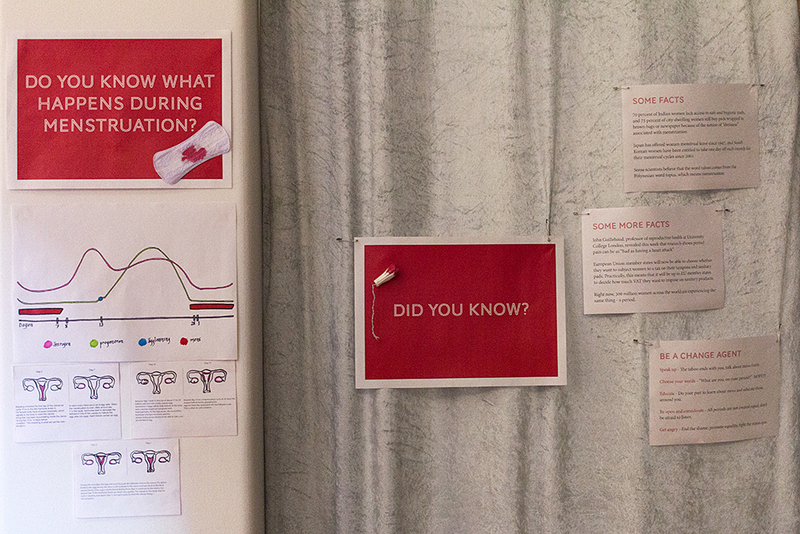 With this in mind, we imagined the centerpiece of our concept - the menstrual cycle. 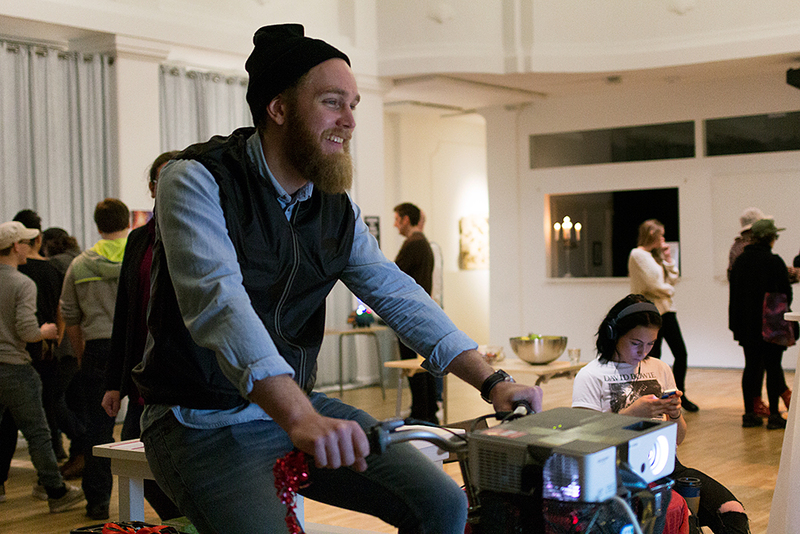 An interactive stationary bike designed to project a looped gif of a bloody sanitary pad. We mounted a projector to the bike which was configured to a Raspberry Pi single-board computer. As the visitor pedaled, a magnet attached to the wheel rotated, triggering a sensor. With each rotation, the next image in the gif was programmed to appear. Simply put, the more the visitor pedaled, the bloodier the projected pad got. We used the bike as a metaphor to tackle the stigma of menstruation. The bike came to represent the imposed “normalcy” aspect of menstruation, as we saw parallels between riding a bike and having your period. This is the very same cycle that women have been expected to ride for centuries in silence. In order to tackle the stigma we knew that we needed a welcome and memorable disruption. By having the visitor interact with the bike, our aim was to draw curiosity and foster an open discussion. During our creative process, we discovered that one aspect of sexual education is often overlooked: the human element. We filmed a 15-minute video where we invited women to share their personal experience with PMS. By only asking one question: "How do you experience PMS?" As we wanted to enable interviewees to speak freely, and lend their perspective on the issue. These interviews served as a form of social proof, by raising awareness and allowing viewers to empathize. Supporting information consisted of: research about the environmental impact, health aspects, the future of menstruation, the cost of menstruation, and the various perceptions of menstruation globally. To further engage and educate visitors we displayed the research through informative facts, eye-catching illustrations, and clarifying infographics. Though the research we included did more than just educate visitors, it helped to substantiate our unorthodox approach. Had we just presented the bike, we knew we ran the risk of being misinterpreted. By including our research, we were able to properly contextualize our approach. As a ragtag bunch of creatives turned tinkers, coders, and explorers.